⚡ Understand how you can get fit without spending crazy amounts of time / cash — keeping it simple. Want to get fit but don’t want to spend hundreds of £s / hundreds of hours? The fitness industry thrives on having people buy endless protein powders, supplements and other products. The fitness industry is also responsible for creating almost all the information / guidance that you’ll find online about how to get fit. So, unsurprisingly, almost all the guidance you’ll find about how to get fit will recommend that you spend a ton of money on products (usually products made by the company the author of the article works for). Sure, some (perhaps many) supplements have been studied in clinical trials and have been shown to have some beneficial effect. But when you’re fairly new to fitness, do you really need them? The other side of things is the amount of time that you’re told to spend exercising — 5 days a week in the gym, 1.5 hours each time. It’s crazy to expect people to dive straight in to such a huge commitment of their time. Between this and the supplement stuff, the majority of people lose motivation and quit exercising. 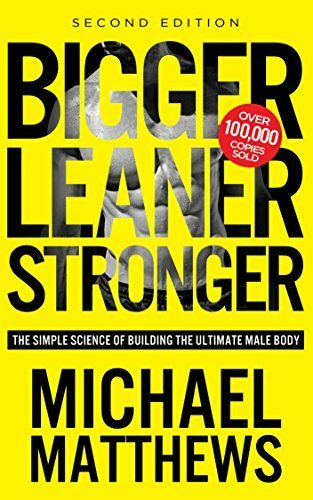 Bigger Leaner Stronger does a great job of busting some myths and laying out a fitness routine that 1) doesn’t take much time and 2) doesn’t cost much money. It talks through the stuff that’s really going to make a significant difference — technique, diet and self-discipline. Although the book’s tagline — The Simple Science of Building the Ultimate Male Body — is clearly targeting it towards a male audience, there is another version — Thinner Leaner Stronger — to balance things out. (FYI — yes, that one does have the tagline The Simple Science of Building the Ultimate Female Body).